This tutorial explains how to download and install Zotero Bibliography Tool on Ubuntu 18.04 with web browser Firefox "Quantum". 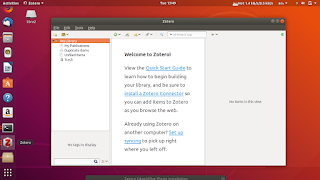 The new Firefox "Quantum" (v57 and later) is the reason why Zotero changed to be stand-alone program with its own window outside of Firefox. 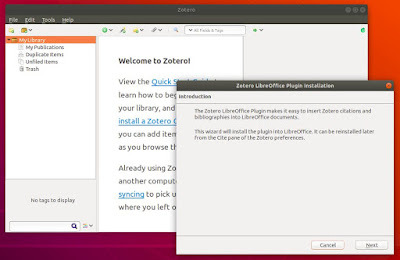 You will download Zotero manually, extract and setup it on your desktop menu, and then integrating it with Firefox and LibreOffice Writer. The whole steps are easy to follow for anyone. Finally, enjoy Zotero and happy researching! Go to zotero.org and download the latest Zotero package for GNU/Linux (the page says "for Linux"). For the version 5.0, the size is +/-60MB. Extract the file in your ~/Downloads folder. You will get a Zotero-blablabla folder inside Zotero-blablabla folder. In the inner folder, you will get Zotero program files and folders. The most important file is named zotero.desktop. Double-click the zotero.desktop file and select Trust and Launch on the dialog showing. 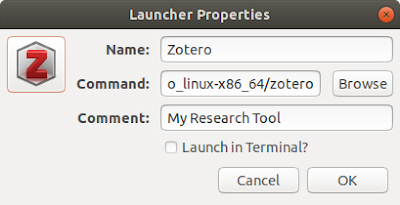 Finally, Zotero runs saying "Welcome to Zotero!". It runs with an additional dialog. This second dialog is only optional and you can Cancel it safely. So basically, to run Zotero you should go to ~/Downloads, go to Zotero-blablabla, go to Zotero-blablabla inside it, and finally double-clicking the zotero.desktop file. To make this long steps instant, right from your menu, follow next instructions. To collect data from the internet, you use web browser. 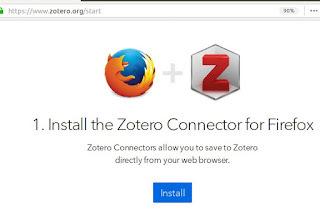 Same goes for collecting data for Zotero database, you need to connect between Zotero and your Mozilla Firefox, simply by installing a special addon called Zotero Connector for Firefox. You should follow this step because Ubuntu 18.04 uses Firefox Quantum, the next-generation Firefox starting from version 57. The aim of using Zotero is to create beautiful citations and bibliography in LibreOffice Writer document. So, not only you need to install addon for Firefox, you also need to install addon for LibreOffice. Open up your Zotero > Edit > Preferences > Cite > Word Processors > press Install Addon button > follow the dialog appears > downloading some packages (this needs internet access) > done. 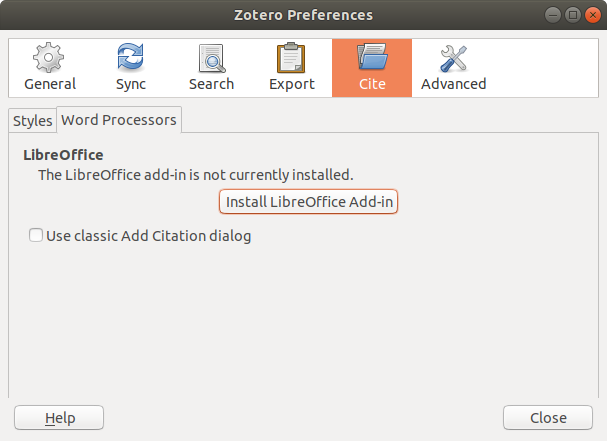 Successful installation will make LibreOffice Writer to show Zotero Toolbar like below. Buttons on this toolbar connect between Writer and Zotero, meaning you can insert citations and references from Zotero into the document. Zotero Toolbar showing on Writer! To use Zotero, you typically browse a website (reference data) with Firefox and press the Save to Zotero button and the website copied into Zotero program (the window). For another reference data, repeat that. To do that, you should have both Zotero program and Firefox running at the same time. Zotero is a free software desktop research assistant to collect references, data and information, to be processed as bibliography and citations in LibreOffice Writer or Microsoft Word documents. 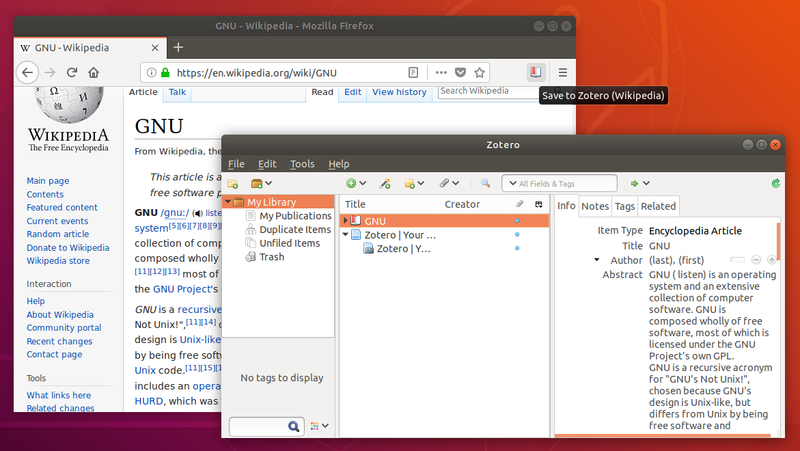 Zotero is available for GNU/Linux, Windows, and macOS. Zotero can be considered as an alternative to the proprietary Mendeley and such research assistant programs.